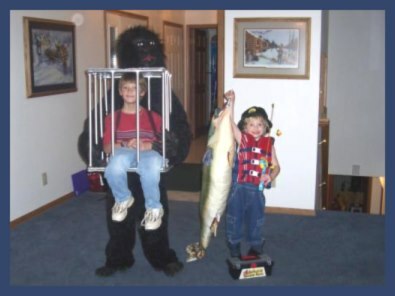 This costume of course shows how a capture of a gorilla went terribly wrong. Many people thought that this was two people!! I bought the gorilla suit and cut a slit for his waist to go through and then stuffed the upper body of the gorilla with newspaper. We had to make a frame to attach to his back in order to support the top of the gorilla and carry the costume. The gorilla eyes were made from white model magic and then painted to look like eyes. The cage was made out of odds and ends (styrofoam, dowels, plastic rods for the corners, metal bars to hold styrofoam in place and to attach the dowels to, and silver spray paint) that I found walking through a local home improvement store. I made the safari outfit out of a basic pant/shirt pattern and inexpensive material. The fake legs were then stuffed and attached to a pair of old shoes. The Costume by my friend Becky was made a few years ago. It is very similar to the Costume above...just a different caged guy. This wild costume features an adult gorilla's costume mounted on a metal frame that's supported by the costume wearer with a belt. 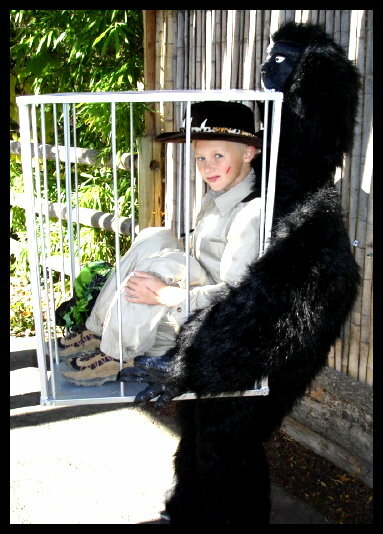 A cage, made from poster board, and fake, stuffed pant legs, gives the illusion of the zoo keeper in captivity, made especially convincing by the gorilla's hands pinned to the side of the container. These types of costumes DO require the purchase of a Gorrilla costume (according to the above instructions). You may also wish to purchase a Safari Costume or Zoo Keeper Costume... also. THEN... you only have to figure out how to put it all together.